UoP Library Web - How do I fetch and carry my resources? 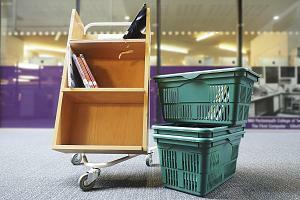 The library provides baskets, including some on wheels, to help anyone needing to carry a number of books. If you have specific problems with lifting and carrying we have a small book trolley which you can collect and return at the reception desk for use in the library. Not all areas are easily accessible, but library staff will be happy to help you locate and carry items from any part of our collection. We want to help you make the best use of the library and its resources. We can provide a book-fetch service and make alternative borrowing arrangements dependent upon each individual’s needs (both long and short term). If you wish to discuss specific needs prior to a visit, please contact library@port.ac.uk or tel: 023 9284 3228.